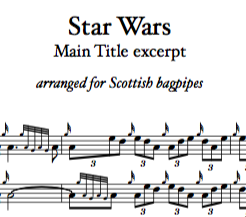 The popular main title theme for the ‘Star Wars’ films is arranged here for Scottish-style pipes. 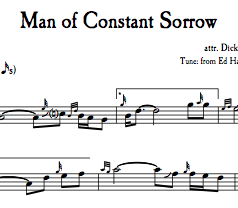 (Introduction and harmony part included.) For more information and audio samples, see further below. Categories: Individual Tunes, Miscellany Tags: america, contemporary, film, movie, U.S.A. The popular main title theme for the ‘Star Wars’ films is arranged here for Scottish-style pipes by Timothy Cummings. 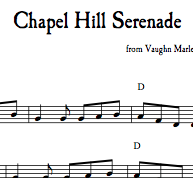 This two-page adaptation includes the 4-bar introductory fanfare, an original closing coda, as well as an effective harmony part for additional pipers. 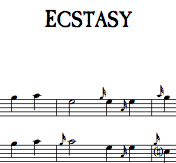 Published here in the pipe-friendly key of A, it will sound in the originally-composed key of B-flat if played on a standard set of Highland pipes. 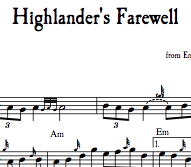 This may be the most successful and accurate bagpipe-adaptation of this theme to date.